In a quiet lane, in one of the many offices in a mill compound in Lower Parel, sits one of the most popular, and at times, controversial Indian English television news anchors. 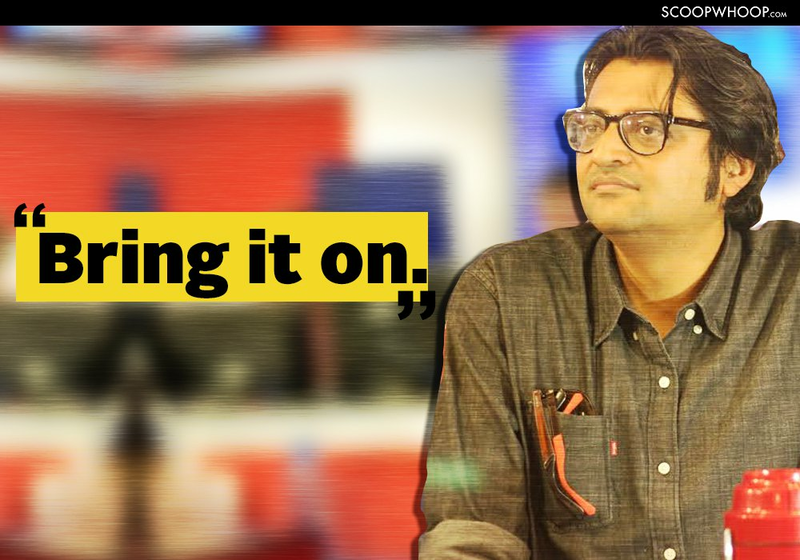 Since having left Times Now, Arnab Goswami has announced that he will be returning soon with a new media venture called ‘Republic’. He has revealed little since then about his future plans. 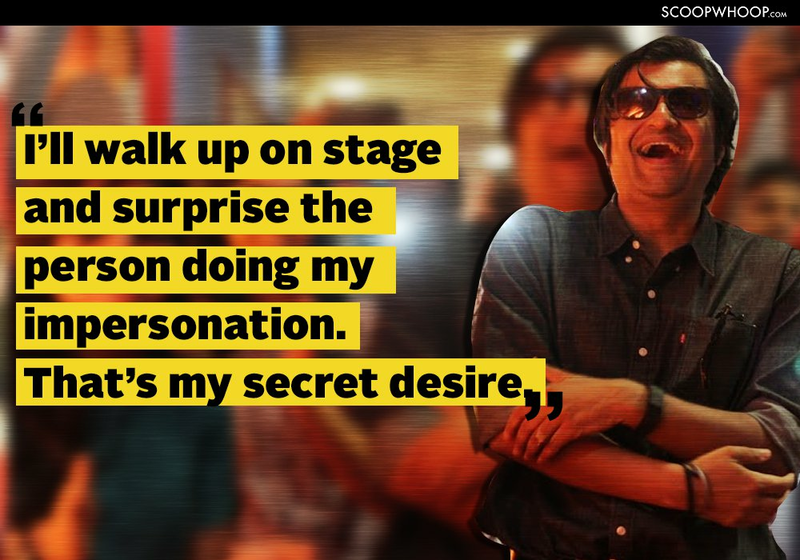 When ScoopWhoop caught up with him on 29th December, a relaxed Goswami emerged after a meeting. Dressed in a casual shirt and jeans, he insists that he doesn’t want to talk on camera. After some pleas, he reluctantly agrees to have a few photos taken, but says they can be taken only after the interview. This isn’t the combative anchor you saw every night on The Newshour, a show that could stretch for much more than an hour. It’s more the anchor that we saw when he did sit-down interviews with prominent personalities. He is measured and chooses his words carefully, but declares that he will take all the questions in the time he has before another meeting. He speaks about being approached in the street by people asking when he’s returning on air and students chanting the name of his upcoming channel at a college festival. But he is also angry about a “paranoid big media house” that he refuses to name, but says is tormenting young journalists who want to join his independent venture. (Here’s a big hint who he may be talking about). 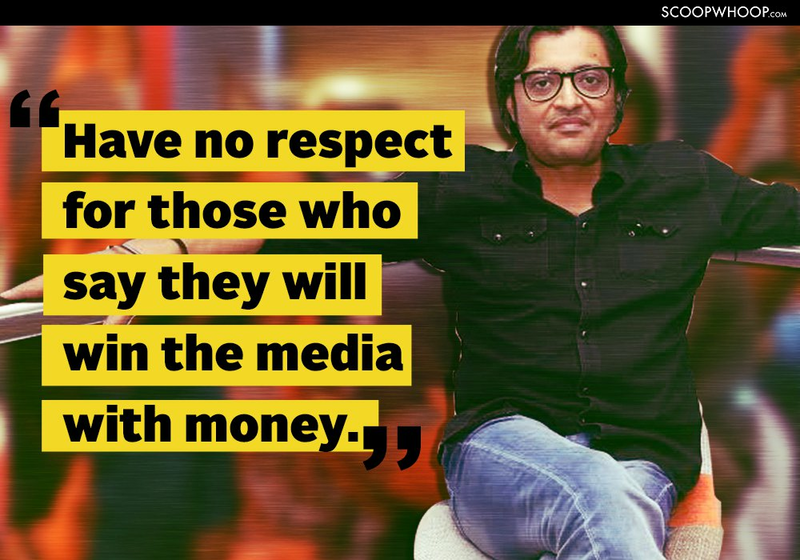 He also says upfront that he won’t discuss the source of funds for ‘Republic’, but will reveal whatever he can about what he says is India’s first independent media venture. 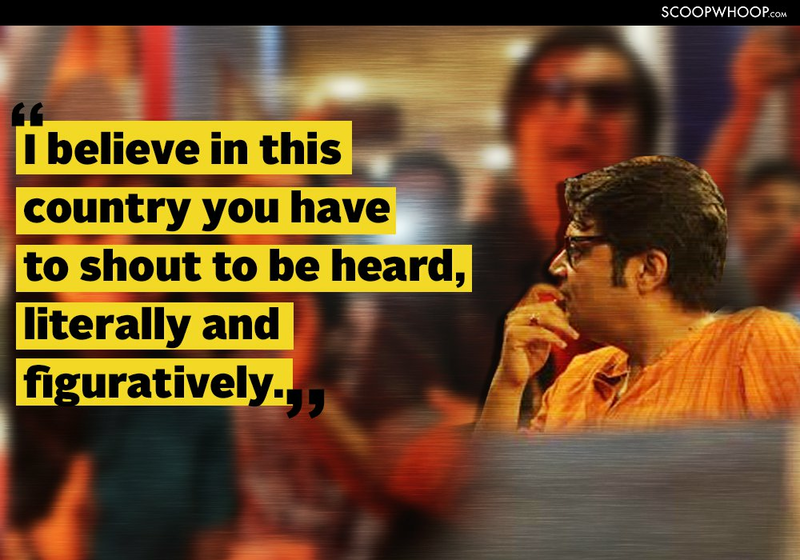 We sit in a meeting room with Arnab and three colleagues, who sit and listen, as the most watched English news anchor (till recently) spoke on a wide range of topics. He spoke about Republic, taking on existing big media houses, starting ‘a people’s movement’ and what’s the one thing he wants to know that no one has been able to tell him. You left at the top of your game. Why would you do that? I have always believed in changing things when people least expect you to. I don't think I was at the top of my game. I think the best is still to come. We've got a great response and I think the response proves that I was right in making the move at this time. What is Republic? We haven't been told much so far... what do we expect? Republic will exist on all media platforms. Linear, non-linear, television, digital, social media and every single platform where we believe our journalism must reach. So we will use every possible technology to take our message and our journalism among the people. Today it is possible to do it on multiple platforms. So we will be a multi-platform, news generation, content creation engine and it is going to be a beautiful journey. So do we have a date by which we will know when Republic is launching? We are going to launch when we are ready. Already there is among people and viewers, much before we've even launched a brand campaign or even taken our logo among the people, there is a tremendous resonance about Republic. I think people will define what Republic is. I think millions of our viewers across India and across the world will define what Republic is. Do you think that puts more pressure on you, this expectation? I think the expectation is that we will truly be the voice of the people. Which I promise you we will be. The journalism that we, and I, have done with my team, especially over the last decade has been a journalism of the people. 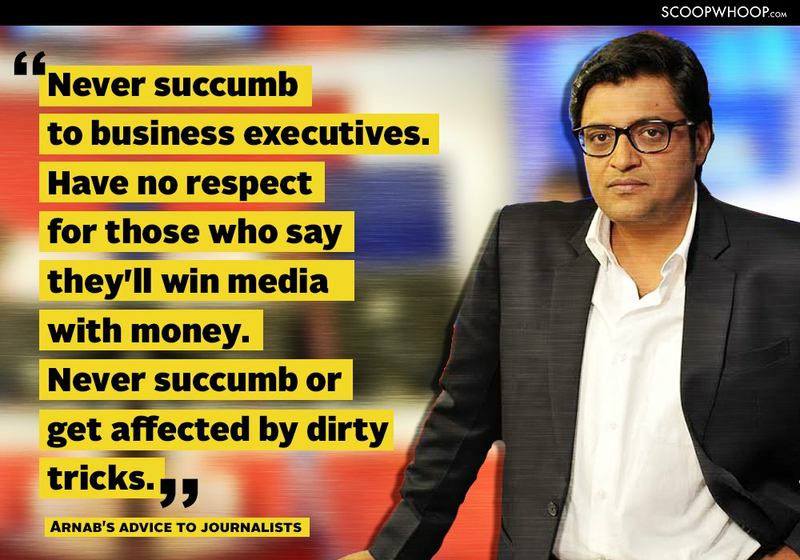 Threats and attacks from a paranoid big media group, outsourced smear campaigns of a paranoid media group, intimidation and unfortunate statements like 'money wins', prove to me even more that there's a need for independent journalism. To this paranoid media group I am saying today: Bring it on. I don't feel the pressure of anticipation. I, on the contrary, feel the excitement and the energy of anticipation. What do you think is wrong with the media today and how do you think Republic will correct it? There are three or four fundamental things that are wrong with the media today and I am not going to be subtle about it. The first thing that is wrong with the media is that there are some people who feel that they have more money than others so they will win. The second thing that is wrong with the media in India today is that it has become 'Lutyenised'. Over-centralisation of Indian media in New Delhi is not a good thing. And the third thing that is wrong with Indian media today is that some part of it has become corporatised. I am not saying that Republic will set correct all of these problems but I think it can be a very strong step in this direction towards correcting this and building a greater balance in the Indian media. Your critics would argue that it was what you and Times Now did that has messed up the Indian media. How do you react to something like that? All my critics are definitely watching me. But having said that, there is no one formula, which is the only way to do journalism. I do my journalism with my heart. I speak the language that people understand and so do my reporters. I believe in this country you have to shout to be heard, literally and figuratively. If amplification of stories is a crime then I disagree with those who bring in the definition of what is right and wrong. The show NewsHour was synonymous with you. Will there be an equivalent on Republic? I haven’t decided but I think it is fair to say we’ll keep doing new things on Republic. We’ll have to wait and watch. But when we come back, we’re going to come back with greater force, greater independence. And everyone expects us to redefine journalism all over again, which we will. What do you think legacy brands are doing wrong and what do you want to change? Some of them have allowed their business executives to interfere in editorial processes. In the case of one big media group, I have information that business heads on a daily basis, openly and transparently, participate in editorial decision making. You need to think about news, you need to think about stories. You need to think about storytelling. Now some of these legacy media groups are not focussing on that. Given how media is, do you think any source of funding can be completely free of political influence? Absolutely. If not today, then when? Distribution has become democratic. So I think it can certainly become independent. Content is king. And so if you can shape your content in a way that people like and people accept, then I think it’s the first step you can take towards being independent. You were criticised a lot for your style of anchoring and Times Now’s policies. Would you do things differently if you could? I would not do anything differently in my life. I have enjoyed every single minute of every working day. You made a few headlines when you wrote a testimonial for the Prime Minister recently. Do you think that given the furore over it you would rethink that? I think that it’s okay. 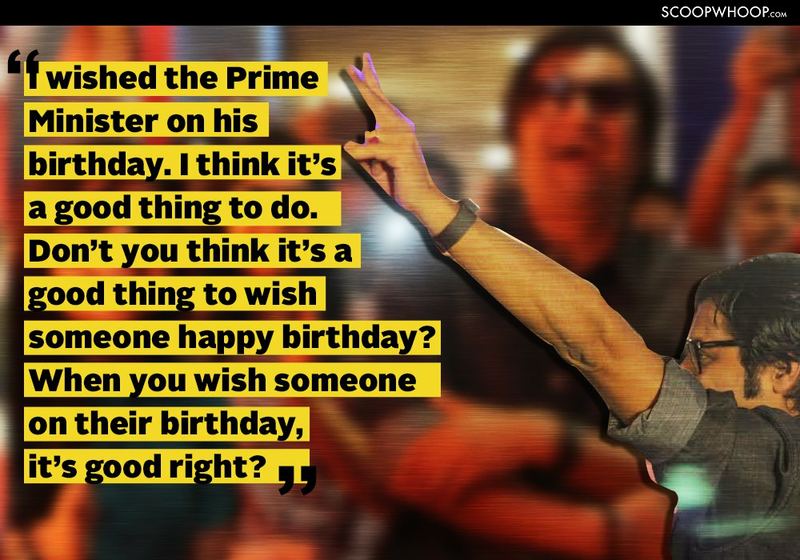 I wished the Prime Minister on his birthday. I think it’s a good thing to do. Don’t you think it’s a good thing to wish someone happy birthday? When you wish someone on their birthday, it’s good right? But doesn’t it raise questions about neutrality of journalists? My journalism, after 10 years in my previous job and after 21 years of journalism, has to be defined by the work I have done. Those people who refused to stand up to any of the scamsters we exposed shouldn’t be teaching me about journalism. You’ve also been accused of bringing the Indian Army into everything which political parties also do now. Do you think that’s been overdone now? I do think you need to back the Indian Army. And I think that those people who don’t see the sacrifices that the Army makes, have no business trying to analyse the army and trying to pass judgement on it sitting in some corner somewhere. Don’t you think that oversimplifies and polarises? It is people who over-analyse it. The ones who don’t want to be for the country. I think they are over-simplifying it. I believe all journalists should be for India. Simple. People say your personality is far removed from what we see on TV. What are you like off-air? I can assure you and the ScoopWhoop readers that I am not always shouting. You are part of pop culture as well. There are memes and parody videos centred on you. How do you feel about that? Does it surprise you? It’s okay. It’s good fun yaar. One day I’ll turn up quietly in one of these theatres where they do these shows and I’ll walk up on stage and surprise the person doing my impersonation. That’s my secret desire. With Republic, does this mean you’re finally going to get on Facebook and Twitter? There's so much pressure for that. I can imagine what would happen on Twitter. I’d be giving my opinion every 10 seconds or something being as opinionated as I am. I do think of going on social media and giving my point of view on things. But I think we’ll be quiet for a few more weeks before we come up with Republic. When you do hang up your boots, who do you see as being your successor? I am not hanging up my boots man. I am not hanging up my boots for a very, very, very long time. 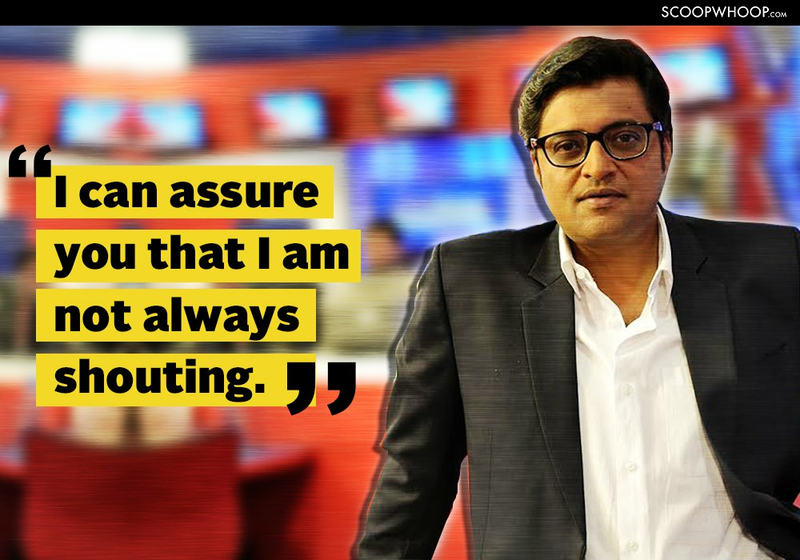 The one thing that Arnab wants to know that no one’s been able to tell him so far? Everything to do with technology. How do you link your email to your cloud, to your data... I am so bad with all that. What’s the one thing you would advise young journalists to never ever ever ever do? First. Never worry about business executives who torment you and harass you if you want to follow your independent media dream. Second. Never succumb or get affected by a dirty tricks department of any paranoid media house. Like I say to them today: Bring it on. We will fight you on television. We will fight you on the internet. We will fight you on social media. We will fight you on every available platform and we will not take your threats lying down. Third, have no respect for those who will say they will win the media with money. Fourth, never allow business executives to influence editorial decisions directly or indirectly. And finally to them I would say: believe in Republic. Republic is a people’s movement. It is India’s first independent media platform. Do everything possible to back our journalism and our mission. Republic is now a public movement, it is a revolution. So join it. Last one: What does the nation really want to know? I think they want to know when we are launching (laughs). We’d like to say: soon.